COLUMBUS, Ohio -- When an arsonist targeted her Dayton, Ohio, home in late April, Kathleen Hanover thought that more than just her garage, deck and the siding on the back of her home had gone up in smoke. An entrepreneur at heart, Hanover had been working with her husband on plans to bring a line of artisan condiments to market. Though the fire didn’t make it inside their home, smoke and water damage conspired to destroy their kitchen, making the couple think that their dream was on hold. On Tuesday, that dream received new life. 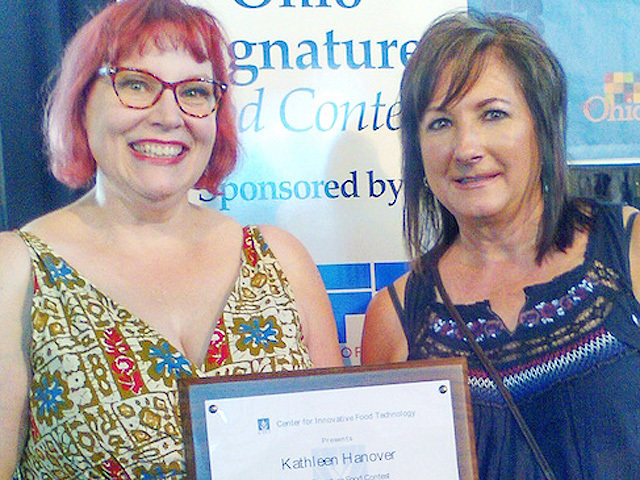 Hanover was named one of two winners of the 2016 Ohio Signature Food Contest, a competition sponsored by the Center for Innovative Food Technology and the Ohio Farm Bureau Federation . The competition rewards winners with technical assistance from CIFT to get their products to market. Established by CIFT in 2009, the Ohio Signature Food Contest helps promote the organization and assistance that’s available to entrepreneurs interested in food-product development. Once confined to single regions of the state, the contest is now a statewide affair thanks to its partnership with the Ohio Farm Bureau Federation, said Rebecca Singer, vice president and director of agricultural programs with CIFT. Hanover’s winning product: Indian Creek Corn Whiskey Mustard, a grainy mustard made with apple-cider vinegar, two kinds of mustard seeds, brown sugar, spices and corn whiskey from New Carlisle, Ohio-based Indian Creek Distillery . Hanover, 51, earns her living as a marketing and public relations consultant, and she also works as a professional public speaker. Her husband, Kaden, is an artist and musician, and the creative couple enjoys concocting condiments and other culinary creations. For Valentine’s Day, Hanover surprised her husband with tickets to tour Indian Creek Distillery, and the two came away excited by the potential of using the distillery’s whiskeys as condiment ingredients. After some experimentation and testing, the couple returned a few weeks later to give Indian Creek’s owners the chance to try their own whiskey in a new way. The Hanovers were encouraged by the Duers’ response, but they also saw an opportunity: Distilleries face steep taxes on their products, and they’re always looking for new revenue streams with stronger margins. Hanover began working on how to bring food products to market. Then came the fire. No kitchen, no mustard. Hanover was ready to give up. One day while going through her email, Hanover found one from Duer that contained a link to an article about the signature food contest. Two days before the contest deadline, Hanover filled out an application and sent it in. A week later, the phone rang. The Hanovers rallied. They bought new ingredients and utensils. They drove back to New Carlisle and bought more whiskey. The winning batch of mustard that impressed the contest judges so much was made in the tiny kitchen of an extended-stay hotel room. It wasn’t just the quality of the mustard that impressed the judges. It was their business plan . If the Indian Creek experiment is a success, Hanover plans to roll out the model to other Ohio distilleries, incorporating their products into condiments and other food items they can sell. “The chance to help other Ohio businesses succeed is really exciting to us,” she said. The contest’s other winner was Akron entrepreneur Adam Fried, who concocted a pesto made from Ohio-grown garlic scapes, the flower buds of garlic plants. Fried did not respond to a request for an interview.